As the `War on Terror' evolves into the `Long War' against Islamo-fascism, it demands an enduring commitment to ensuring the security of the United States and its allies. This policy is based on the requirement to maintain control in a fractured and unpredictable global environment, while paying little attention to the underlying issues that lead to insecurity. It is an approach that is manifestly failing, as the continuing problems in Afghanistan and Iraq demonstrate. Moreover, `control' implies the maintenance of a global order that focuses on power remaining in the hands of a transnational elite community, principally focused on North America and Western Europe, but extending worldwide. This elite largely ignores socio-economic divisions and environmental constraints, and sees continuing stability as being best achieved by the maintenance of the status quo, using force when necessary. This collection of essays by Professor Paul Rogers argues that this post-Cold War security paradigm is fundamentally misguided and unsustainable. It concludes with two new essays on the need for a new conception of global security rooted in justice and emancipation. 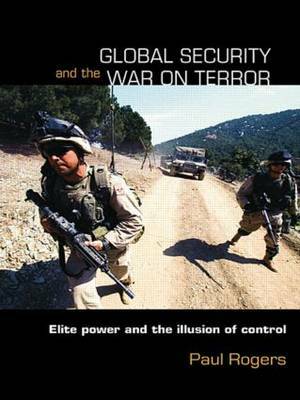 Global Security and the War on Terror will be essential reading for students and scholars of security studies, the Cold War, international relations and development studies.